Before you read these answers, be sure to find the questions regarding Christmas Movies with dogs on the previous blog post. Let us know which dogs you remember in Christmas movies. Let’s see how many Christmas movies you remember and let’s see how many of the dogs in the movies you remember! 1 ) Which Christmas movie had a dog named Puppy Paws, son of Santa Paws, who goes on an adventure and learns the true meaning of Christmas? 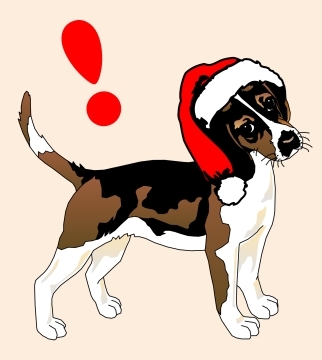 2 ) What is the name of the Hallmark Christmas movie where a foster dog helps bring a family closer together? 3 ) In which Christmas movie did the neighbor’s dogs eat the holiday turkey, forcing the family to eat their holiday meal at a Chinese restaurant? 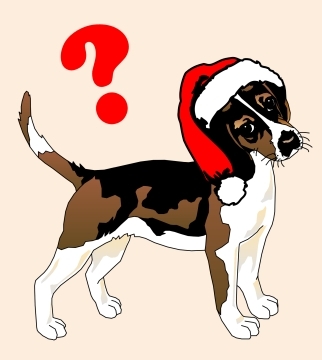 4 ) In which Christmas movie was the pet dog coerced into pulling a sled full of presents stolen from a small town? 5 ) In which Christmas comedy movie was there a Rottweiler aptly named Snot? 6 ) In which Christmas movie did the family dog decorate his dog house and fall into the commercialized Christmas trap? 7 ) In which Christmas movie did a well-known lovable scruffy mutt help Kris Kringle find the true meaning of Christmas? 8 ) In which Christmas movie did this big Saint Bernard rescue an elf and a magic toy bag? If you didn’t already guess these Christmas movies, find the answers later this week! Everyone is getting more stuffed than the turkey this Thanksgiving. Everyone, that is, except the family dog. It’s tempting to spoil him on this special day, but you have to be careful with what kind of food you give him. 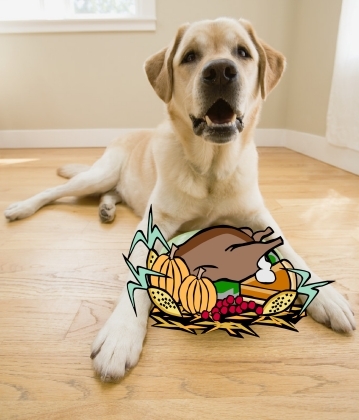 Check out this blog from our Pet Auto Safety.com website for holiday food which could be harmful to your dog – No Turkey Bones About It – Food Harmful to Dogs. What is a setter dog breed? Setter dog breeds evolved from spaniel dog breeds which began in Spain. When the advent of firearms changed the way people hunted, a different kind of dog was needed. And so evolved the spaniel and setter gundogs. The term setters came about because certain spaniel gundogs were taught to find game, then sit and wait for the hunter. Sitting, or setting, is no longer practiced. Setters working as gundogs today freeze when they find game, then retrieve it for the hunter. The English Setter dog breed may be the oldest of the sporting dogs, perhaps as early as the 14th century. But modern cultivation did not begin until the 1800s in England. Edward Laverack is credited with developing the breed for show. Then Purcell Llewellin acquired some English Setters and re-developed them as gun dogs. Today, the show dog English Setter is larger, has a larger deeper muzzle, and only comes in what is called a belton pattern. The belton pattern on the English Setter refers to the roan ticking of a color with white. There is a blue belton English Setter which is white with black ticking, lemon belton (white with light brown or lemon yellow ticking), orange belton (white with orange ticking, liver belton (white with brown ticking), and a white with black and tan ticking. The field dog English Setter can be belton colors but they can also be white with solid patches of color such as black, lemon, orange, liver, or black and tan (tricolor). The liver and lemon colors are rare in both the show and field English Setter. The show dog English Setter stands about 24-25 inches high and weighs about 50 to 65 pounds. The field dog English Setter is generally about ten pounds lighter. Both varieties have an oval skull, long and lean head, dark brown eyes, and a long and square muzzle with pendant flews. His ears are low set and his tail is carried straght out and tapers to a fine point. The hair of the English Setter is flat and of medium length. He needs brushing every two to three days and clipping every few months. Other than the shedding, the English Setter can make a quiet calm house pet if he is properly exercised. He is lively and playful and needs at least one hour of exercise daily. He is also affectionate, easy going, and relatively easy to train. The English Setter is good with other pets and does well with children. His friendly nature means he is good with strangers too so he does not make a good watchdog. He may also be inclined to have separation anxiety if left alone. Like most big dogs, the English Setter is at risk for hip and elbow dysplasia. This risk can be reduced with proper breeding so if you are considering buying an English Setter, be sure to thoroughly research the breeder. A good breeder will have hip dysplasia tested in both parents through the Orthopedic Foundation for Animals. Another test which may have been done is an eye test as the English Setter dog breed also has risks of blindness. 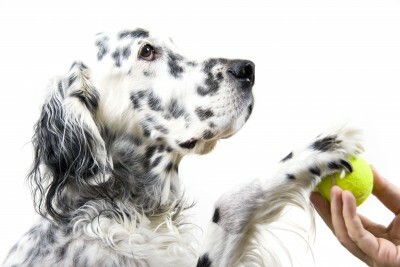 Deafness is also an issue and the predominantly white English Setter dog breeds are prone to skin allergies. Whether you are looking for a show dog, gun dog, or house pet, the English Setter is a good dog. As a show dog, his belton coloring makes him a beautiful dog. As a gun dog, he loves to work. And as a house pet, he is a friendly companioin. To learn more about the English Setter dog breed, check out the “English Setter Comprehensive Owner’s Guide“. 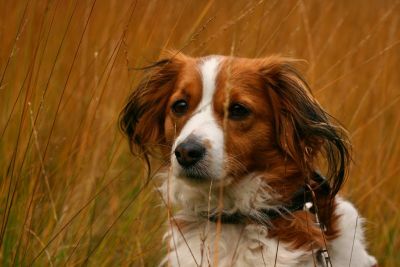 The Kooiker dog, also called the Kooikerhondje, is a spaniel dog breed from the Netherlands. He has a friendly and moderate temperament to make him a good companion. But he was originally bred to help duck hunters. The Kooiker dog doesn’t point out or retrieve ducks. According to “The New Encyclopedia of the Dog” by Bruce Fogle, the Kooiker dog entices the ducks to swim closer to shore and within shotgun range with his “antics and bushy white tail”. The Kooiker dog is a relatively small spaniel weighing about 20 pounds or so. The hair on his face is short, but the hair on his body is heavy and long. I am reminded of a Shetland Sheepdog when I see his build, tail, and feathered coat. Even his coloring somewhat resembles a Shetland Sheepdog. He does not have the saddle back coloring but he has the white face with nose stripe, white chest, belly, legs, and tail tip. The rest is brown with black tips. His nose does not taper as much as a Shetland Sheepdog and his ears seem to have longer hair. He also appears to have longer legs. For more information on the Kooikerhondje and other dogs of the world, check out “The New Encyclopedia of the Dog“. Two years and the American Dog Blog is going strong. If you’re a new visitor, check out some great posts you might have missed. #1 most viewed post – Book Review – “A Dog’s Purpose” in July 2010. #2 – Information About the Bernese Mountain Dog & the Greater Swiss Mountain Dog in June 2010. #3 – Information on the West Highland White Terrier (Westie) Dog Breed in October 2010. #4 – About the Really Great Great Dane Dog Breed in August 2010. #5 – Dog Breed Feature – The American Staffordshire Terrier (Pit Bull) in November 2010. #6 – Teaching Your Dog Not to Beg While You Are Eating in June 2010. #7 – Cute Dog Photo – Why is This Dog Eating Snow? in January 2010. #8 – New AKC Dog Breeds!!! Introducing the Leonberger, Cane Corso, and the Icelandic Sheepdog in July 2010. #9 – Before You Get a Great Dane – A Dog Like Marmaduke in June 2010. #10 – About the Australian Shepherd Dog Breed in February 2011. Most top viewed posts are from 2010. Is that because these posts are better or because the 2009 posts were the firsts posts when the site was not yet popular and the 2011 posts are too new? Also, most posts are about dog breeds. 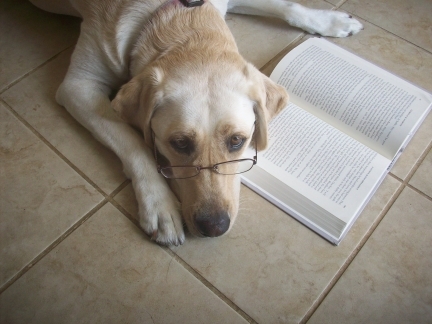 Do you like reading about dog breeds? Considering the views you would think so. But the top viewed posts have very few if any comments. #1 – How to Teach Your Dog to Catch a Frisbee in October 2011. #2 – Why Dogs Growl and Why They Should Be Allowed to Growl in September 2011. #3 – Pet Product Review – PAC1 Leader as the Pull No More Dog Harness in May 2011. #4 – The Scottish Terrier Dog Breed in January 2011. 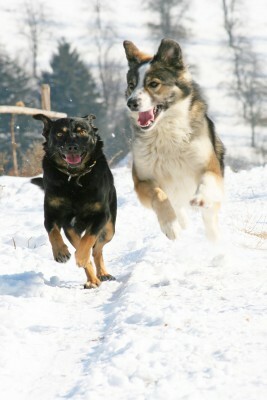 #5 – Cold Weather Tips for Dogs in January 2011. At this time, the most comments on one post is 5. All of the most commented posts are from 2011. This is probably because the American Dog Blog has more visitors than it did in 2009 and 2010. Thank you everyone for reading and posting comments on my American Dog Blog! 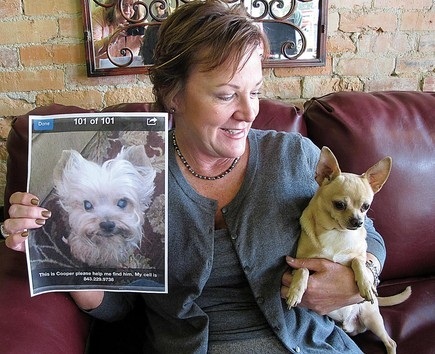 To visit other great dog blogs, start at the All Things Dog Blog for the Saturday Blog Hop. 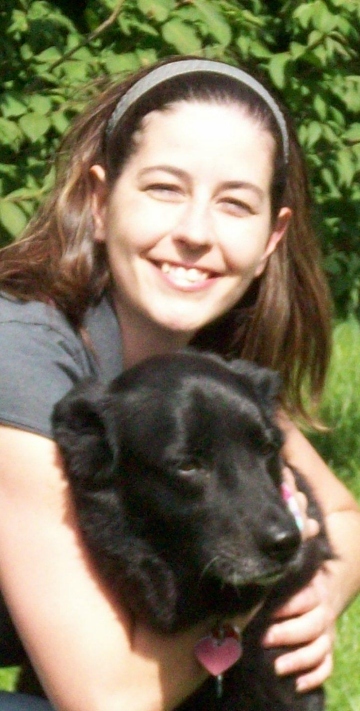 We have recently had an interview with Animal Cafe for our Pet Auto Safety.com site. Please check out the article and listen to the podcast at Animal Cafe.co. If you are in the area of Hartsville, South Carolina please be on the look out for this silver Yorkie. Here is the full article at our other blog, Pet Auto Safety Blog.com. That I know you'll always keep. Under sky of perfect blue. Who came to you today. And so very, very wise. This morning left her eyes. This special love of mine. In your land that's so divine. With a warm hug and hello. From me - who loves her so.